The Motorola V620 is intended as the replacement for the popular V600 model and builds on the V600's impressive feature set, and comes in an attractive new case. Featuring a large 176x220 pixel display in 65,000 colours, VGA resolution digital camera and Bluetooth, this is a capable handset. In addition, the V620 is a quad-band GSM phone, so it will work on every GSM network in the world, has a WAP 2.0 browser and GPRS data, supports email and instant messaging, video recording and MP3 ringtones. 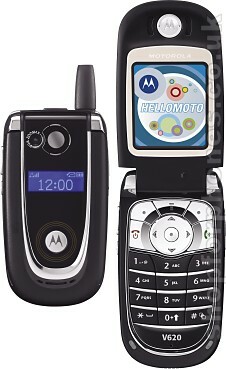 The Motorola V620 is available in black or silver colour combinations, depending on carrier and availability. The V620 has an impressive maximum 7 hours talktime and up to 12 days standby and measures 88x48x24mm, weighing 115 grams. Available now on O2 and Vodafone contracts, and SIM Free. Subscribe to our newsletter for updates. 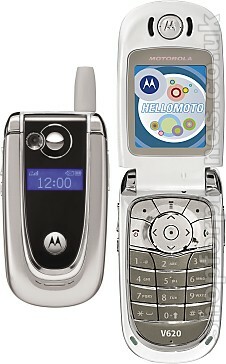 If you want more information on the Motorola V620, subscribe to our mailing list. Also, the Update newsletter contains general news about new phone releases.